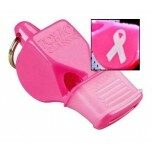 Pink referee whistles and lanyards make great breast cancer awareness ideas for volleyball referees.Your pink whistle or lanyard purchase allows us to donate proceeds from each sale to the American Cancer Society. Works well. Loud if blown correctly. Great color! Crew enjoyed them. 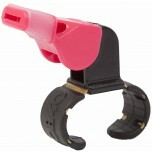 Works well, no issues, glad to have found a pink finger whistle for my other white hat friend for October! Good referee whistle like the other Fox 40 whistles I have and for a good cause also.